Here's the visibility rules for Open Ground, Hills, and what happens when other terrain is placed on top of a hill. I think this is the most time that I've ever spent on a single rules section, double and triple-checking all of the interactions. As it turns out, hills and elevations are way more complicated to explain than Area Terrain, which I'll finish up the rules for next. By the way, all the bold and underlined type are bookmark links in the PDF to other pages. So that you can (gasp!) jump right to the definition of something that you don't know. This section covers the visibility effects of Open Ground, Elevated Terrain (Hills), and the visibility interactions between the different parts of Compound Terrain. Target Models standing upon Open Ground, and which are not in base contact, or behind a terrain feature, are considered to be Visible targets. Unless the Firing Model is standing on Elevated Ground. The elevation of a piece of terrain matters quite a bit when your troops start shooting at each other. Models on higher ground can see further, and therefore have a better tactical awareness of their surroundings than models on lower ground. If a Firing Model is standing on elevated ground, and the target model is standing on open ground (or a lower level of elevated ground) then the target model will count as Exposed to the firing model. In the reverse case, when a firing model is standing on open ground (or a lower level of Elevated Ground), and the firing model is standing on a higher level of elevated ground. The target model will then count as Concealed to the Firing Model. Just because one model is some fraction of an inch higher on the table than another, it doesn’t mean that the elevated ground rule will apply. That would be far too bothersome and argument prone! Instead, the Elevated Ground rule will only apply if the rules for a particular terrain type explicitly specify that it does. Thus, you will get a visibility advantage for holding a hill, or the upper level of a ruin. But the base of a stand of woods, or the raised edge of a river won’t confer any meaningful advantage to either the firing or the target model. The most common type of Elevated Terrain is, of course, the Hill. Which is simply a raised area of Open Ground. The area of a hill’s base defines the extent of it’s visibility effects. While the very top of the hill defines it’s elevation height for any model standing on it. 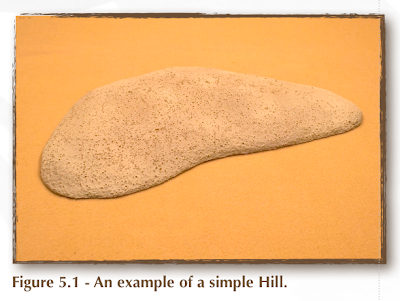 Other than that, the precise shape of a hill matters very little. Unless you are performing a TLoS test to see if a model, or it’s base, is Hidden. Relative to a particular hill, there are four positions which a model can occupy and receive benefits to it’s Visibility. 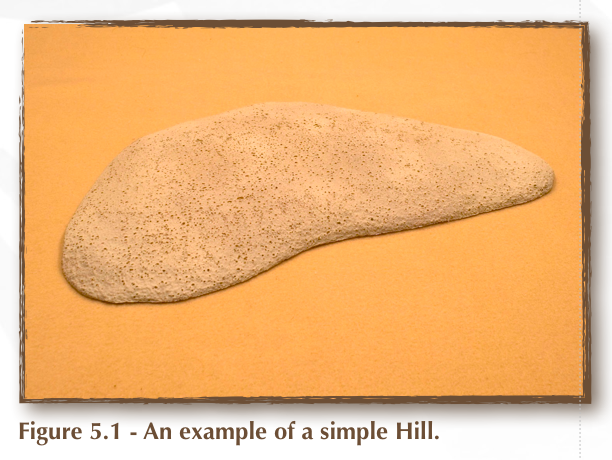 If a model’s base horizontally overlaps any part of a hill, then it is considered to be ‘on’ the Hill. Note that the exact part of the hill they’re on doesn’t matter to their elevation, or their visibility. All models on the same hill are considered to have the same elevation. Models on a hill are considered to be on elevated ground. The height of which is equal to the total height of the hill. 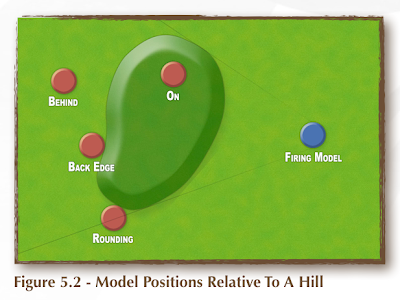 If a target is not in base contact with the hill, and a horizontal line cannot be drawn from any part of the Firing Model’s base to any part of the Target Model’s base, without passing through any part of the same Hill, then that model is considered to be Behind the hill. Models behind a hill are considered to be Concealed. If the firing model is on a higher elevation than the Target Model, then the target will only be Concealed if it’s base is found to be completely hidden behind the hill in a TLoS test. If a Target is in base contact with a Hill, and a horizontal line cannot be drawn from any part of the Firing Model’s base to any part of the Target Model’s base, without passing through the same Hill, then that Model is considered to be on the Hill’s ‘Back Edge’. Models on the Back Edge of a Hill are always considered to be Concealed. If a model is in base contact with a Hill, and a horizontal line can be drawn from any part of the Firer’s base to some, but not all, of the Target’s base, then that model is considered to be ‘Rounding’ the Hill. Target models rounding hills are always considered to be Obscured. If a Hill has multiple ‘steps’, or levels, then treat each level as it’s own separate Hill. 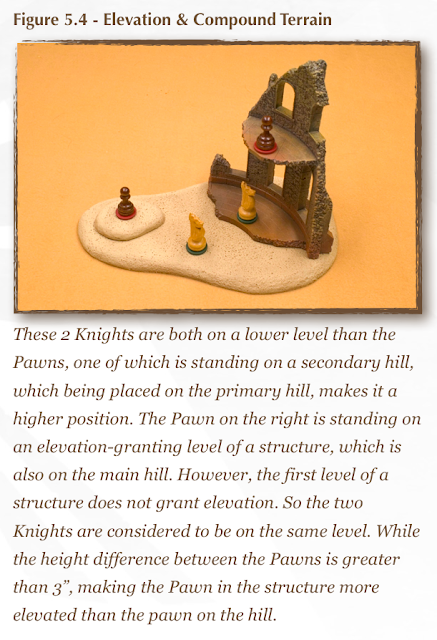 A 2-level hill is therefore treated as 2 different hills. One stacked upon the other. Which is a form of Compound Terrain. By it’s nature, Compound Terrain will have multiple rules that govern a model’s final visibility. So if there’s a conflict, which piece of terrain’s rules take precedence? The answer is quite simple. If a Target Model’s position, relative to 2 or more pieces of terrain, causes that model to have multiple possible levels of visibility, then apply the available level of visibility that gives that Target Model the highest bonus to it’s Evasion. See Figure 5.3 for an example. For Firing Models, you will always apply the available level of visibility that gives the Firer the least bonus, or largest penalty, to it’s Awareness. 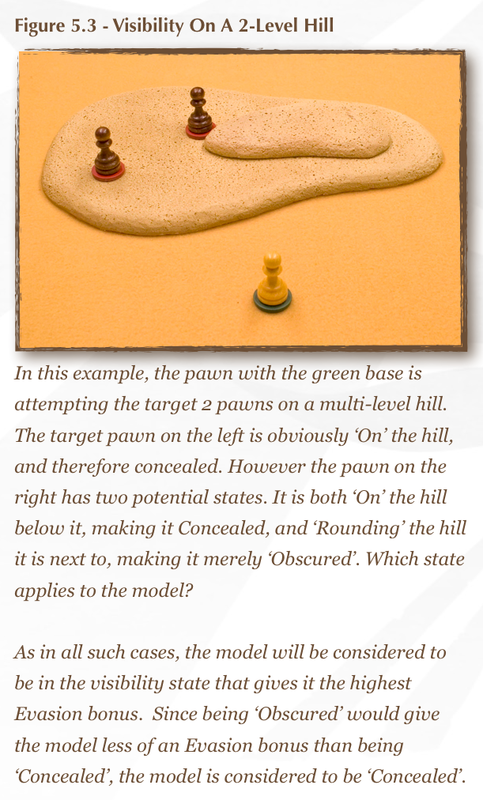 Thus, if a firing model is standing on a Wooded Hill, then the Awareness penalty for being within a Wood will take precedence over the Awareness bonus that the Firing Model would normally receive for being on a Hill. If one model is standing on Elevated Ground, and the other is standing on Open Ground, then the model on Elevated Ground, regardless of the actual height difference between the models, is always considered to be higher than the other. If both models are standing on Elevated Ground upon different terrain pieces, then measure the vertical distance between the bottom of the base of each model. If the vertical difference between the two models is found to be less than 3 inches, both models are considered to be on the same level and will be considered Visible to each other. Finally, if a model is standing on an elevation-granting Hill or Structure, which is itself On a Hill, then the model on the secondary ‘child’ terrain will always be considered to be at a higher level than a model on the primary ‘parent’ hill. While each ‘child’ terrain feature will be considered separate when comparing the height of models standing on them. See Figure 5.4 for an example.